CURRENT EXHIBITION: Steve Miller "Fashion, Animal, Sound"
Save Event: CURRENT EXHIBITION: Steve Miller "Fashion, Animal, Sound"
Share CURRENT EXHIBITION: Steve Miller "Fashion, Animal, Sound"
This exhibition by Steve Miller is a collection of x-ray images of animals, musical instruments, and fashion objects. 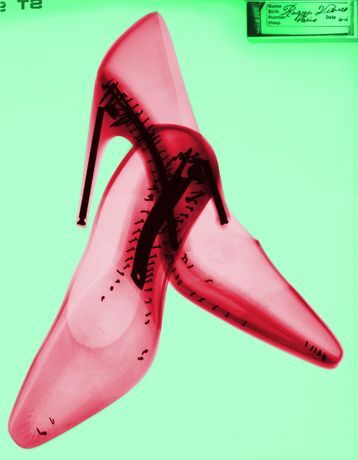 The Robin Rice Gallery is pleased to present “Fashion, Animal, Sound,” a photographic exhibition by Steve Miller. The opening reception will be held on Wednesday, November 9th from 5:30 to 8:30 pm. The show will run through December 18th, 2016. 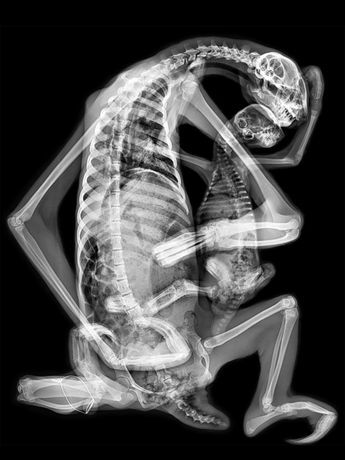 The images featured in Miller’s “Fashion, Animal, Sound” are all x-rays. 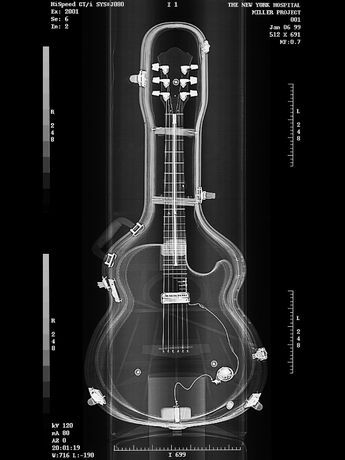 The photographs, mounted on aluminum in shadow box frames, display the inner mechanisms of things we don’t ordinarily see. They reveal the inner constructs of objects or animals, creating a truly three-dimensional viewing experience. The images of “Fashion, Animal, Sound” are perplexing in their simplicity. 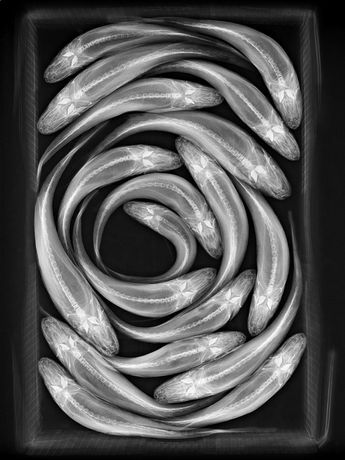 In the invitational image, “Fish Circle,” the bodies of several fish, photographed as an x-ray, swarm around a central axis in a circular formation. It is almost as if the viewer is looking at a Rorschach inkblot test. The show delves into themes of consumption—and overconsumption—in modern culture as seen in Miller’s stunning two photographs of Vivier Escarpin stilettos. As the only colored images in the show, their bright shades of fuchsia and rich purples entice viewers in the same way as fashion does. This leads into Miller’s black and white photographs of flora and fauna, which expose the staggering natural patterns that are found internally in both animals and plants. In one image, “Turtle Eggs,” Miller captures x-rays of three turtles and the eggs inside their bodies. We feel connected to them, as if we know something personal about them, pulling at our conscience. The gallery long sidewalls will be painted a deep black. While the white back wall will display an x-ray image of an alligator on a 6 foot piece of black glass. The light that hits the wall reflects through the sculpture and illuminates it. 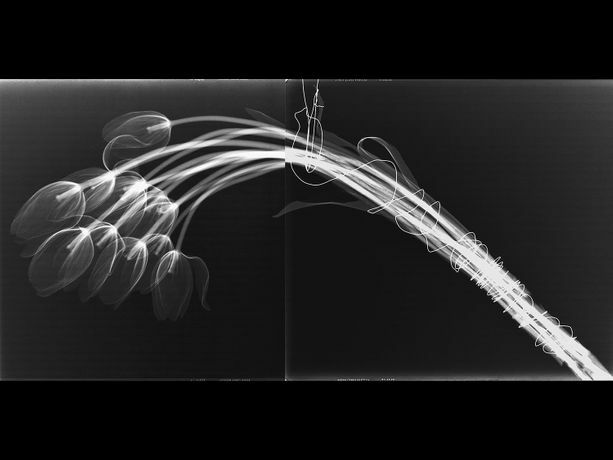 The show also features other 3-D works of Miller, including x-rays printed on white surfboards. In using the surfboard as a tool, Miller has created a sort of eco-trophy, to replace the classic taxidermy trophy, like a stuffed alligator, nodding again at this same idea of consumerism. The white surfboard will be suspended from the gallery ceiling. 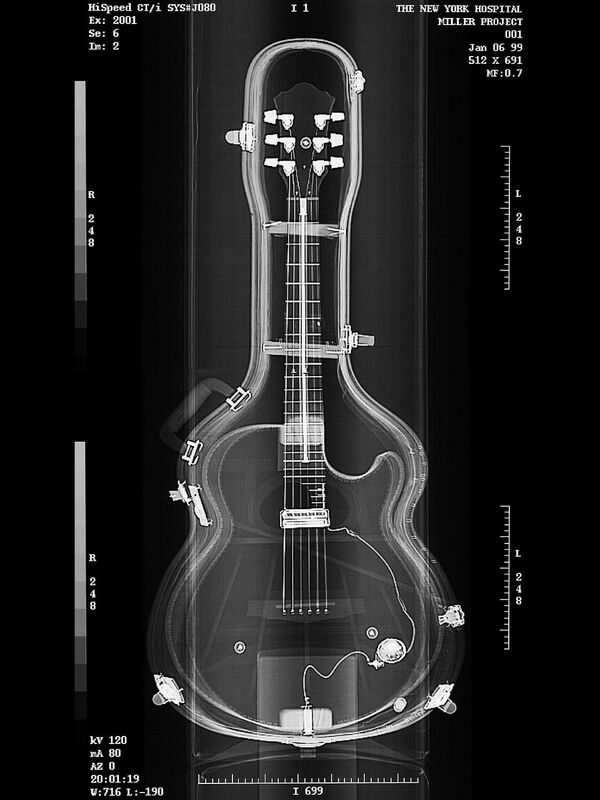 Finally, incorporating images of musical instruments, Miller adds a new dimension of sound. Where we see noisy objects in a quiet, yet bold, black and white. We are left with a powerful silence that brings the show full circle. Steve Miller was one of the first artists to experiment with computers in the early 1980s, and his work today continues to integrate science and technology with fine art. He has presented many solo exhibitions at major institutions in the United States, China, France, and Germany. His exhibitions have been reviewed in Le Monde, SüddeutscheZeitung, The New York Times, The Boston Globe, ArtForum, ARTnews, and Art in America.